A native of Japan, Honda is a pianist, composer, and sound artist. She has developed a distinctive holistic approach to music, showing exceptional sensitivity in relating to other art forms, technologies, and musical styles ranging from jazz to Indonesian music to contemporary piano. After emigrating to the United States at age 19, Honda began building her career as a classical concert pianist, performing concertos and chamber repertoires in Europe and the U.S. while earning her BA from Bethany College in Kansas. In 1999, she moved to Los Angeles to complete her MFA at the California Institute of the Arts. 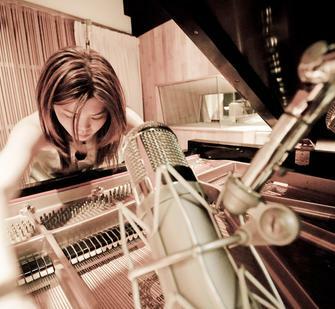 After graduation in 2003, Motoko started the Okiro Ensemble and Sound Escape Project, presenting with numerous collaborating artists and presenting at major venues such as the Ford Amphitheater, Barnsdall Gallery Theater, and REDCAT, as well as museums, jazz clubs, festivals, and underground venues. A notable interdisciplinary collaboration is MAMO Music and Dance Collective with choreographer/dancer Maureen Whiting, SmellLAB with cellist/composer Theresa Wong, and M-Rare with visual artist Carole Kim and sound designer Jesse Gilbert. Read more at motokohonda.com.